Clean the shell first with water/soap, then with bleach in order to whiten the surface. In the dark room, warm and solubilize the silver gelatin- I use MACO variable contrast [Photographer’s Formulary]. Paint the liquid on the shell, in one direction. Stand upright. Remove excess from edges. Air dry or carefully blow dry. Repeat  but paint at right angles. Stand, dry, and store in light tight bag [I use old print paper bags]. Expose to film placed in the enlarger. I usually I run a “test shell” with different exposure times in order to get the correct exposure. Carry through developer [Dektol], 2 fixer baths, and water. Dry thoroughly. 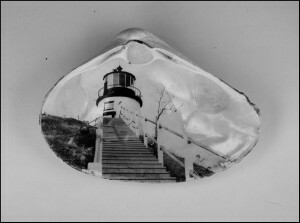 It is critical that all of the silver in the photo emulsion be fixed, or else darkspots will appear upon aging. Spray with clear Krylon acrylic spray [obtained at any hardware store], dry. Enjoy your finished clam shell, and feel free to ask me any questions about this technique. I hope you find it useful.